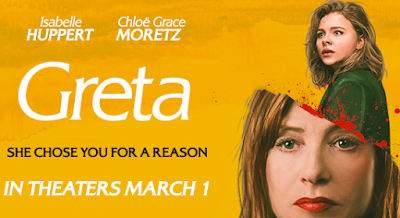 Home » Past Screenings » GRETA Advance Screening Passes! Do you want to see GRETA before anyone else? Learn how you can see an Advance Screening to see it before anyone else. A sweet, naïve young woman making a go of it in the Big Apple, Frances (Moretz) doesn’t think twice about returning the handbag she finds on the subway to its rightful owner. That owner is Greta (Huppert), a peculiar pianist with a predilection for Romantic music and a desperate need for company. Frances recently lost her mother and feels alienated by her father; Greta has lost her husband, and her daughter lives far away. The two become fast friends — but that friendship rapidly assumes ever more sinister hues as Greta’s attentions escalate. 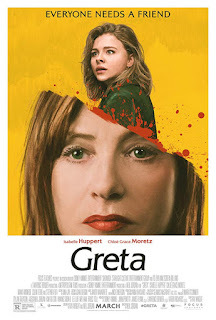 GRETA is in theaters on March 1st, 2019.